June 29th, 2018 | Moving Tips. By the time your moving date arrives, you may feel like you can’t possibly put any more items on your relocation checklist. By this point, you will likely already have hammered out the details in your home and work arrangements, utility agreements, travel itinerary, and other fundamental logistics. But have you considered moving truck parking? Some homeowners assume that once they have decided on a moving company, those homeowners have nothing left to do other than to pack up their belongings. Unfortunately, this assumption could potentially delay your moving day as you work to ensure that moving truck can access and park on your property. In this blog, we guide you through the steps you may need to complete so you’re ready to go with moving truck parking when the movers pull up. When you begin to think about movers arriving to load up your belongings, you may assume that the truck must be parked in the immediate vicinity. If you live in a house or multiplex, this proximity may mean the truck ends up in your driveway or on the road in front of the property. If you live in a row housing or an apartment, the parking lot may be closest. While these locations are preferred, professional movers understand that not every property is readily accessible to moving vehicles, especially not semis. If you think your property may not accommodate moving truck parking, ask your moving company if they offer alternatives. For example, your movers may offer a shuttle service where they load a smaller vehicle multiple times to take your items to the truck or to a shipping container. As you evaluate whether or not you believe your property can accommodate moving truck parking, use the dimensions of the vehicle as much as possible. Ask your mover about the length and height of the cab and trailer. Additionally, if you have had an onsite consultation, check if the mover believes the truck will have enough turning space to pull in and out. Once you know the dimensions of the truck, check that the area is clear of overhead wires, structures, and foliage that might block access. Measure out space on either side of where the truck will park and remove any tripping hazards and other obstructions. Ideally, your mover will be able to back the truck into the parking space so that the loading door is as close to your front door as possible. In this situation, you only need enough of a gap on the sides so that people can get by. However, if the space is too narrow for the vehicle, you must account for all items passing alongside the truck. Once you have begun to visualize the moving truck in its parking space, you are more likely to have a clear picture of where the vehicle will be parked. In many cases, moving trucks, unfortunately, don’t tuck neatly into residential driveways, so you may need to plan ahead. You may have checked if your mover had current transit permits for your area, and your destination if you plan to cross state lines. Also ensure that the company has the relevant permits necessary for moving truck parking. These permits usually come from the city and only last for a period of days, so you may need to obtain the permit immediately before your planned moving day. Check local parking restrictions for ordinances against commercial vehicles parking on the street or across sidewalks that intersect driveways if your driveway isn’t big enough. If you choose to work with a local moving company, representatives may be able to provide you with helpful resources of at least a good starting point of inquiry for determining which regulatory measures your situation requires. In addition to municipal restrictions, you may need to ask your homeowner’s association, property management company, or landlord about the need for parking space reservation and potential penalties for taking up multiple spaces in a parking lot. Once you know which permits and reservations you need so that the truck can park at your property for as long as it takes to get loaded up, put in your applications for these arrangements in advance. In most cases, you can obtain a permit or reservation by visiting the relevant office in person or applying online. Use these guidelines to ensure you don’t have to worry about moving truck parking on your property for any longer than the time it takes for the driver to check his or her blind spots and pull in. Still looking for a mover you can trust to handle parking, loading, and transportation in your upcoming transition? 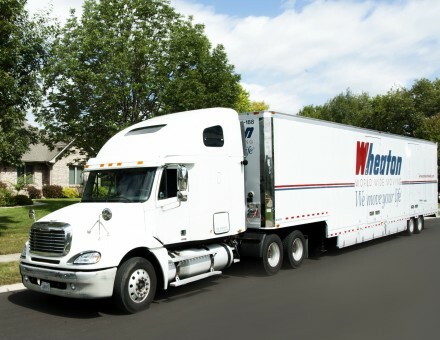 Partner with the experienced team at Wheaton World Wide Moving for help packing, transporting your items, and unloading your belongings at your new home.